Cardinal Woodpecker ( Dendropicos fuscescens fam. Picidae) Kruger Park Birds & Birding. The Cardinal Woodpecker (Latin name Dendropicos fuscescens) is described in Roberts Birds of Southern Africa, 7th Edition. This bird has a unique Roberts number of 486 and you will find a full description of this bird on page 135 also a picture of the Cardinal Woodpecker on page 145. 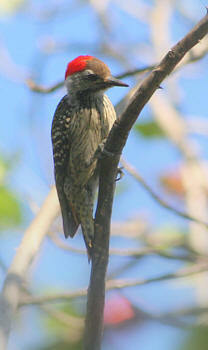 The Cardinal Woodpecker belongs to the family of birds classified as Picidae. In terms of distribution of the Cardinal Woodpecker in the Kruger National Park you may not see it in all areas. Cardinal Woodpecker : see above distribution map. You will find that the male Cardinal Woodpecker plumage and colours are different to that of the female Cardinal Woodpecker. This image is of the male ... the female does not have the scarlet head cap. This bird was photographed in a commo coral tree at Punda Maria in August 2006. You will normally see the Cardinal Woodpecker in pairs.